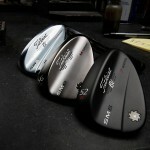 The Acushnet Company today introduced the latest generation of Titleist Vokey Design Spin Milled 6 wedges. The wedges will be available March 11 in stores and shops for around $149 each – a good price for some of the best and more popular wedges on the market. Each of the Vokey SM6 wedges, according to the Acushnet Company, feature a new Progressive Center of Gravity (CG) design that aligns the CG with the impact position of each loft to produce precise distance and trajectory control with exceptional feel. Engineered using cutting-edge CAD technology, the Progressive CG is visible technology on the back of the wedge. The Acushnet Company says the low loft (46º-52º) SM6 models each feature a low CG that increases ball speed on average by 1.5 mph (three to five yards). This low CG position, according to Acushnet, provides a precisely aligned progression from a typical iron set. It is visible technology, highlighted by a thinner topline and raised lower section. The mid lofts (54º and 56º) each feature a mid CG position, precisely aligned between the low lofts and high lofts, that provides precise distance gapping and exceptional feel. The high lofts (58º-62º) each feature a high CG position that produces tighter distance dispersion, improved trajectory control and better feel. The high CG position, according to Acushnet, is precisely aligned with the impact position of high lofted wedges, higher on the face. It is visible technology, highlighted by a raised upper section. In addition, the company says Master Craftsman Bob Vokey’s fiveSM6 sole grinds have been “fine tuned’’ through his work with the world’s best shot makers, providing golfers of all skill levels with improved shot versatility for their swing type, shot making style and course conditions.